College football’s Week 12 slate is mostly one where you can feel free to rake up whatever leaves are still in your yard and maybe run a few errands. There’s not a whole lot going on this weekend, and it’s not just the SEC taking it easy this week. Just three games going on this weekend are head-to-head meetings between ranked teams, and you need access to The Longhorn Network to watch one of them. So here’s an attempt to dig deep to see if there are even five things worth watching this weekend. Of course there are, but you may need to be a bit more dedicated than a casual fan to have much appreciation for this weekend in college football. Notre Dame appears to be in a fairly comfortable spot with just two games left to play this season. At 10-0 and ranked No. 3 in the College Football Playoff rankings this week, all the Fighting Irish have to do is pick up two more wins and then start preparing to play in their first playoff. Having starting quarterback Ian Book back this week after sitting out last week’s win over Florida State is certainly a confidence boost for the Irish. Standing in the way this week, however, is No. 12 Syracuse, and the Orange are not to be overlooked even if the oddsmakers are making the Irish a 10.5-point favorite. Syracuse continues to climb the rankings and has already reached the highest rank in the AP Top 25 since Donovan McNabb was slinging the Orange into the Orange Bowl. The way Dino Babers has Syracuse’s offense ticking, this should be the biggest challenge left for a strong Notre Dame defense. 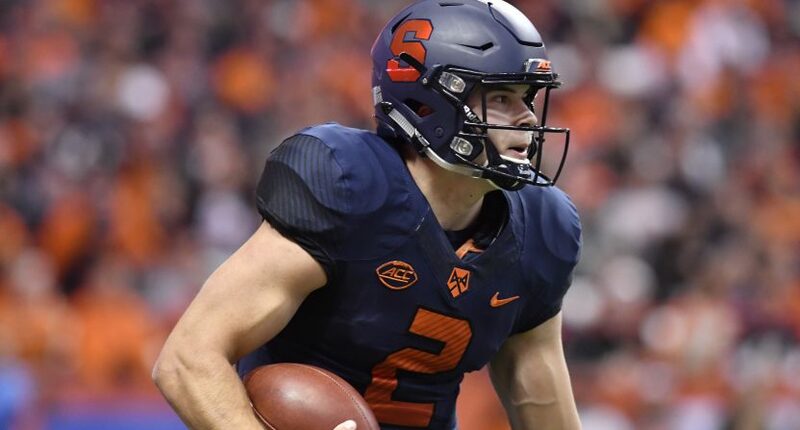 If the Orange are going to pull off a potentially playoff-changing upset in the Bronx (this game is being played at Yankee Stadium), they will need quarterback Eric Dungey to avoid making mistakes. Dungey has been the MVP for Syracuse this season, but in each of Syracuse’s losses he’s thrown more interceptions than touchdowns. Syracuse lost on the road at Clemson in late September, 27-23. Although Dungey scored two touchdowns on the ground, he finished the game without a touchdown pass and one interception. The following week at Pittsburgh, Syracuse lost in overtime, 44-37. Dungey was intercepted twice in the game and completed just 18 of 38 passes for 195 yards and a touchdown. Dungey is a red-zone threat though, and he’s scored at least one rushing touchdown in each of the past seven games. The problem for Syracuse may be that Notre Dame’s defense will know it has to focus on Dungey, so it will be imperative Babers has a plan. When Notre Dame closes in on Dungey, then Syracuse must have an option ready to catch the Irish off guard. Running back Moe Neal should balance things out in the running game, and Jamal Custis will need to make some big catches. If Notre Dame survives this game in Yankee Stadium, then it will be on to Los Angeles next week with a chance to essentially clinch a spot in the College Football Playoff. Syracuse is every Notre Dame hater’s favorite team this weekend. One spot in the Big 12 championship game could be booked this weekend, or nothing could be decided this week and we’ll go down to the wire in the Big 12 next week. Four teams are in the running, with Oklahoma and West Virginia sitting in the top two spots going into Week 12, one week before they meet in Morgantown to close out the regular season. An Oklahoma win and a Texas loss to Iowa State would send the Sooners back to the Big 12 championship game. A West Virginia win and an Iowa State loss to the Longhorns would allow the Mountaineers to reserve their spot in the conference title game before hosting Oklahoma next week. West Virginia has a potentially challenging trip to Stillwater to play Oklahoma State this weekend. Oklahoma State just lost a tough one at Oklahoma last week. Maybe it was the emotions of playing in a rivalry game against a team that plays no defense, but we’ll see if Oklahoma State is capable of making Will Grier, David Sills, and Dana Holgorsen sweat a little bit this week. Oklahoma has a much easier matchup this week against Kansas, so things really do come down to what Texas does with Iowa State. If Texas wins this weekend, the Longhorns are still in the running, no matter what Oklahoma and West Virginia do this weekend. A Texas victory this week will make Texas fans West Virginia fans next week, as the Longhorns would get in ahead of Oklahoma in the event the two rivals tie for second place in the Big 12 standings. What about Iowa State? The Cyclones stay alive for a spot in the Big 12 championship game with a win in Austin. Iowa State owns the head-to-head tiebreaker with West Virginia, so Iowa State will be pulling for either Oklahoma State (this week) or Oklahoma (next week). But if you REALLY want to get crazy and have a four-team race in the final week of the season in which all four could potentially grab a spot, then you are rooting real hard for Kansas to win at Oklahoma. That keeps Texas alive even with a loss to Iowa State. ESPN has sent College GameDay to Orlando ahead of UCF’s home game against Cincinnati, and for good reason. The matchup between No. 11 UCF and No. 24 Cincinnati looms large not only in the AAC East Division, but also the entire Group of Five landscape. For UCF, a firm grasp on the chance to play in a second straight New Year’s Six bowl game may be within reach this weekend against the Bearcats. All season long, the belief has been every Group of Five team may be chasing UCF. That remains the case this weekend, and a win against Cincinnati would put UCF one step closer to fulfilling their mission of being the first Group of Five program to reach the New Year’s Six in consecutive seasons. If UCF beats Cincinnati in Orlando on Saturday night, UCF will clinch the AAC East Division and will host the conference championship game in two weeks no matter what happens against South Florida. That puts UCF in a great spot, and it’s incredibly unlikely a team from the Mountain West Conference or any other Group of Five conferences will sniff them. But what if Cincinnati wins this weekend? Then things get heated. A win by Cincinnati would give them the inside track to the AAC Championship game and would very likely allow them to move up in the rankings ahead of No. 23 Utah State (and, of course, stay ahead of No. 25 Boise State). And, of course, UCF would be ineligible so it wouldn’t matter where they are ranked if Cincinnati ends up winning the division. Temple could actually help UCF in this scenario by winning on Saturday against South Florida. A three-way tie between UCF, Temple, and Cincinnati could still go UCF’s way, but at the very least it gives all three teams something to play for in the final week (yes, Temple could still win the division too). But the Mountain West is stirring right now. All the conference needs is for Utah State and Boise State to avoid losing this weekend, and Fresno State winning to potentially creep back into the top 25 would certainly help. Utah State and Boise State play each other next week, so having a top 25 matchup is the best-case scenario in play for the MWC, even if it does need a helping hand or hands from the AAC. And yes, UAB is still technically in the mix too as a Conference USA favorite at this point. But if UAB loses at Texas A&M this week, that’s probably the end of the line for UAB’s longshot dream. The past 36 seasons of college football have closed with Florida State playing in a bowl game, any bowl game. At 4-6 this season, that streak is at serious risk of being snapped this weekend. Florida State must win their final two games of the year against No. 20 Boston College and No. 13 Florida to extend the bowl streak to 37 years. It would be one heck of a disappointing way for the Willie Taggart era at Florida State to get underway, but things have been heading this way for a few years now for this once-proud program. The good news for Florida State is Taggart has a track record of improving programs during his tenure. The problem is that may not be enough to satisfy some disgruntled fans with the way this particular season has played out. Misery loves company, right? If that’s true, then Florida State may have some company to commiserate with as Virginia Tech is also in jeopardy of not playing in a postseason bowl game for the first time in since 1993. The Hokies aren’t quite on the cliff just yet, however. Virginia Tech is 4-5 with just two games remaining. The Hokies have to win each in order to qualify for a bowl game at 6-5. A game earlier this season against East Carolina was canceled due to weather and no make-up game has been scheduled. Adding a game against an FCS opponent is out of the question too on such short notice, as doing so would require Virginia Tech to get to seven wins due to already having played an FCS opponent this season. If Florida State loses just once and Virginia Tech loses just once, then the Georgia Bulldogs will be owners of the longest active bowl streak in the nation with a 22nd consecutive bowl game coming up this bowl season. Sure, the SEC has a bunch of teams playing cupcakes this weekend and the entire schedule from coast to coast this weekend is rather bland, but we do have some good historic rivalries on tap this weekend. The Pac-12 has two in-state rivalries to settle some scores this weekend with Stanford and Cal in one game and USC and UCLA in the other. Stanford and Cal are both bowl-eligible this season and Cal head coach Justin Wilcox has already notched wins against previous employers at Washington and USC. Getting a win against the Cardinal would be the cherry on top for Cal’s season, as it would clinch a winning season against the biggest rival they have. UCLA head coach Chip Kelly could have a terrific opportunity to strike against his new rival at USC. The Trojans are a puzzling team and Clay Helton is on a bit of a warming seat in Los Angeles. Kelly adding a little more tension to his adversary’s pile would be a highlight of an otherwise difficult season in Kelly’s return to the college football sidelines. The FCS has some good old-fashioned rivalries going on this weekend as well, including the long-running series between Lafayette and Lehigh and, of course, The Game between Harvard and Yale. The Ivy League crown won’t be on the line, but the annual meeting between the Crimson and Bulldogs is always worth noting. The glee club is certainly ready. This is Harvard-Yale, you guys. You don’t see the Michigan and Ohio State glee clubs coming out swinging like this, do you? We’re coming down to the finish line, so be sure to soak up as much of this college football action while you can.